For his work Taki, Naohiro Ninomiya found inspiration in Nachi Waterfall, an example of so-called suijaku syncretic Shinto-Buddhist painting from the Kamakura Period (13th-14th Century). This painting on a traditional hanging scroll in the collection of the Nezu Museum provides important information for research on various aspects of landscape paintings. 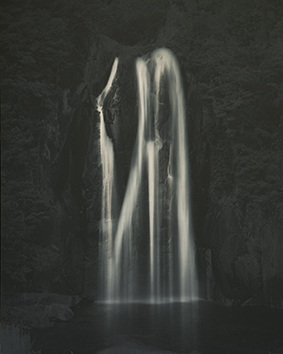 Ninomiya photographed a number of Japanese waterfalls. In his dark room, he printed them very darkly and subsequently toned them with selenium, particularly heavily brushing the water, creating unique and dramatic ‘painted’ images.